July 14, 2015 By Tiffany 3 Comments By clicking on our links, we might make a SMALL commission - Thanks for the support! See our full DISCLOSURE here. This is our favorite summer time tradition! 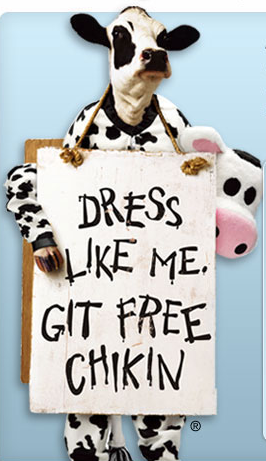 The Chick Fil A Dress like a cow day! It is coming up on July 14th, 2015 – you can find out more HERE and also get some help with your costume. If you dress COMPLETELY up you get an entire meal free. If you wear a partial costume, like just a mask you get a free entree’. These are my kids dressed up in a previous year. 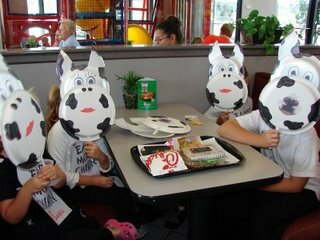 We made masks, they wore white and black with spots, they were completely dressed up and we ate there for breakfast, lunch and dinner free! My kids get WAY into it, they work on their costumes for days and so we make the most of the day by going for each meal. It is a fun tradition in the summer for us and it keeps them busy! Those masks are adorable! Do you have the pattern you could post for us non-creative types? Literally threw my hands in the air with excitement reading this reminder of one of the best days ever. HAHA.